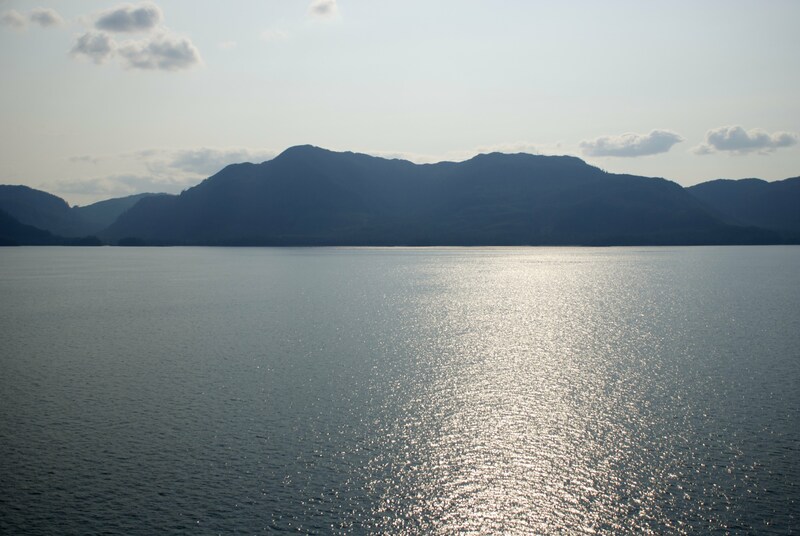 The Star Princess spent all day at sea, sailing south toward Victoria, British Columbia. We only have two more days onboard before we disembark in San Francisco. At this point in our itinerary the inevitable return to reality is starting to settle in. 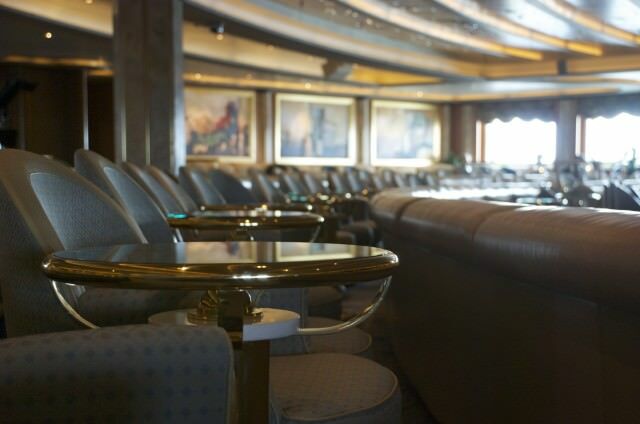 We’re looking back at our time on the Star Princess, reflective and relaxed. We’re realizing just how memorable our vacation has been…and…just how much food we’ve actually consumed. Yes. That. You knew it was coming. It’s part of the proverbial cruise experience and I can’t leave these Live Voyage Reports behind without an article dedicated entirely to food. I wrote previously about how to stay active and fit onboard. It may seem as though this article is the counter argument, but not necessarily. 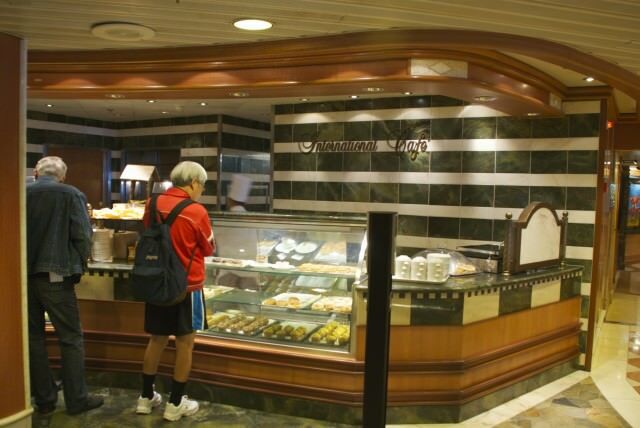 You can indulge as much as you’d like on cruise ships, the legends are true. However, you can also find reasonable portions and healthy options. I bounced between indulgence and sanity throughout our trip, so I can discuss both with a degree of authority. 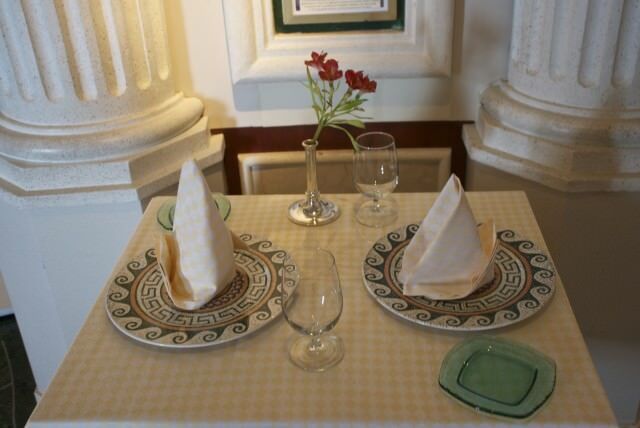 First, the important decision of Traditional or Anytime Dining. Princess strikes the perfect balance between autonomous Anytime Dining and the tradition of nightly dinner reservations (see also: smart casual suit coats, the same wait staff and table, many times the same dinner companions, etc.). Heather and I opted for Anytime Dining without hesitation. The Traditional Dining crowd tends to be older, but that wasn’t actually a factor in our decision. We selected Anytime for the likely reason anyone selects it: Freedom to eat what we want, when we want it, where we want it, or to opt out. By far the most casual dining option is room service, which is entirely complimentary on the Star Princess. It’s tough to beat breakfast in bed or dinner in your slippers on the balcony. If you want breakfast delivered in the morning, simply fill out the card left next to the chocolate on your pillow after turndown service. You may also request fresh fruit that is delivered daily around 3:00pm. Hang these forms on your doorknob and sleep well. After one particularly long day of excursions for both of us and a long night of writing ahead of me, we decided to order a room service dinner. We were both pleasantly surprised by the food. The menu in the room is different than any we’d seen around the ship. Our best guess is that room service shares a kitchen with Shooter’s, the sport’s bar (think sandwiches, salads, and fries). If you’re in a comfortable, room service sort of mood, it hits the spot. 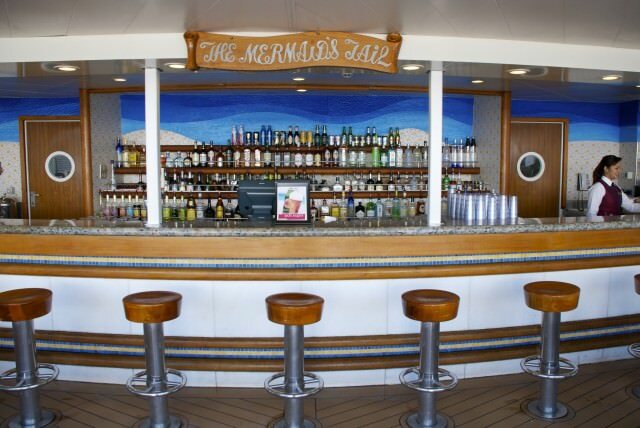 The most casual public dining options are located on the Star Princess Lido Deck. You have three choices near the outdoor Neptune’s Reef & Pool (four if you decide to drink your calories at the Mermaid’s Tail bar). Trident Grill serves quick burgers, hot dogs, and fries. It’s just what you’d expect from poolside food. A welcome realization for Heather and I, since neither of us eat red meat, was that Trident Grill also serves veggie burgers and chicken breast sandwiches. Next to the grill is Prego Pizza. You can request an entire pie delivered to your room for $3.00, or you can snag a quick slice poolside. Prego always serves pepperoni and margherita, then adds a special that changes daily. I noticed the specials are sometimes themed to our itinerary, such as the Glacier Pie yesterday (essentially a classic white with six different cheeses). The third poolside option isn’t a meal but rather an ice cream shop. I don’t want to talk about how many soft serve twist cones I’ve had over the last 10 days, so let’s just move along. Horizons Court is also on the Lido Deck. 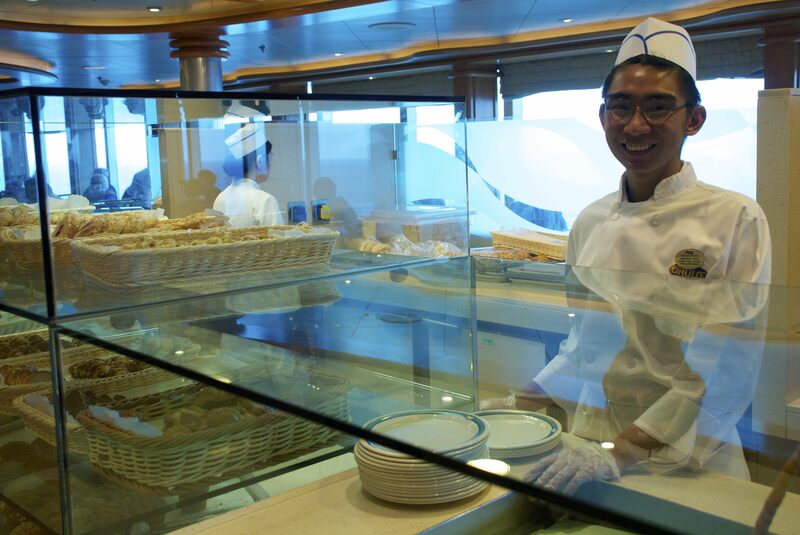 Horizons is where the cruise ship buffet magic happens. Horizons is open from 5:00am to midnight. The amount of food prepared and served in Horizons, and the variety of food, is staggering. 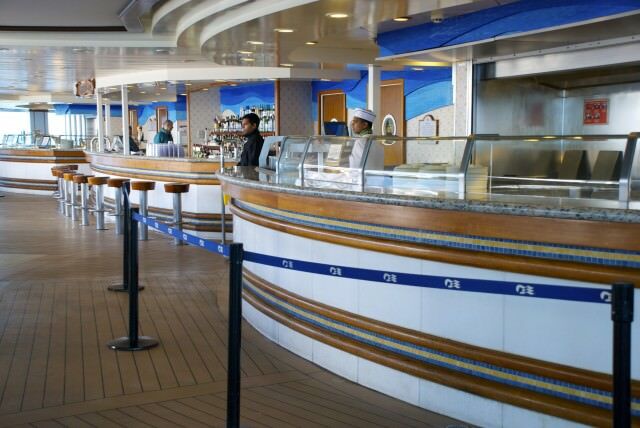 The Star Princess carries 2,600 passengers at full capacity and the buffet is, in fact, all you can eat. Beginning at 5:00am they cycle through 19 hours of continental breakfast, full breakfast, lunch, light snack, dinner, and another light snack. 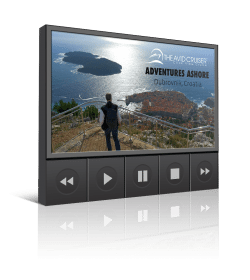 If you lose track of time on a cruise ship it means you’re relaxing properly and doing it right. Even if you hit peak performance relaxation and barely know what day it is, never fear, just make your way to Horizons and they will feed you. They’ll also do it with a smile. A handful of Princess staff know Heather and I by name at this point, particularly the breakfast staff. Finally, we were pleased with the amount of vegetarian options available, including non-meat proteins other than cheese, at all times of the day. The next step up on the dining scale of formality is the International Cafe located in The Piazza, Deck 5. While it’s still grab-and-go, unlike the options previously mentioned, I wouldn’t recommend wandering into The Piazza in your swimsuit and wet flip flops. The International Cafe is open 24 hours a day. In my late nights spent in the nearby internet cafe, I observed a hip, young, beautiful crowd from 11:00pm onward. The International Cafe is also home base for specialty coffees. You can purchase these a’la carte per cup, but Princess wait staff also spent the first three days of the cruise up-selling passengers on a punch card that discounts your caffeine. Heather and I had lunch here and it’s exactly what you’d expect from a European delicatessen: cold pre-made sandwiches, paninis pressed to order, salads, croissants, sweet pastries, and tarts. I noticed yogurt parfaits, danishes, and oatmeal when I passed by early this morning. The unique bonus of the International Cafe is the setting. The Piazza is beautiful, always bustling with activity, and live string quartet music seems nearly constant. This is hands down a favorite for both of us. It feels familiar and very much like the dining experiences we favor at home and abroad. Our less-casual restaurant experiences centered mostly around Anytime Dining dinners and a couple non-buffet breakfasts. 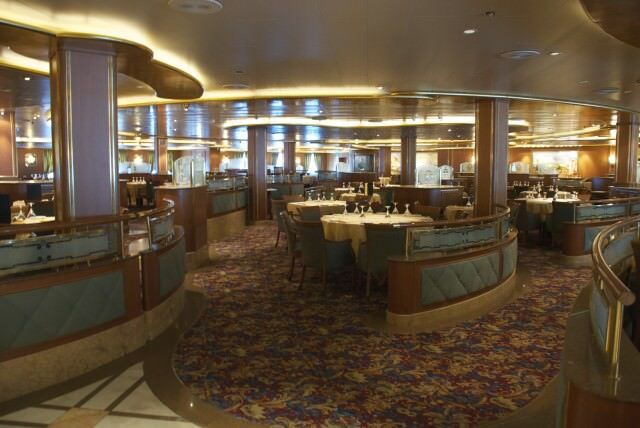 Portofino and Capri are the primary dining rooms on Deck 7 and 6, respectively. Dinner at Capri is served 5:30-9:00pm, and Anytime diners can chose to eat at Portofino for breakfast, lunch, afternoon tea, and dinner after 7:30pm. They begin seating Traditional Diners in Portofino at 5:30pm. The menu changes nightly, but there is an “Always Available” section with dishes like salmon, pasta, and caesar salad. They always have vegetarian options clearly marked on the menu and the selections are excellent. One thing to understand about these restaurants is the communal table concept. It’s likely, unless you want to wait it out, that you’ll be sat at a table for four, six, or eight guests. Conversations tend to center on previous cruises, previous trips to our current location, bucket list travel goals, and for some reason, the most random facts possible about your hometown. Sometimes people are delightful and it’s a pleasant evening, and sometimes not so much. It’s all part of the cruise experience. Just go with it. The Crown Grill and Sabatini’s are small, upscale venues that require a $25 per-person cover and reservation. Heather and I went to Sabatini’s on the fjord / spa day. It was well worth the cover and the southern Italian menu was spot on. We discussed that if we replicated that dinner in Salt Lake City, we’d likely have spent $80 each, making Sabatini’s a great value. 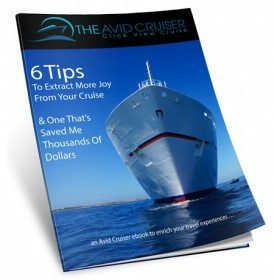 It’s easy to slip into the groove of a cruise ship and expect everything to be free, so the $25 can seem off-putting to some. We enjoyed six courses (including a whole Branzino in Crosta di Sale, that our waiter skillfully deconstructed table side to the sound of our applause). In true Italian style, we were left alone to meander through the meal at our own pace. Heather and I met on a group tour in Italy just over a decade ago and we were all sorts of nostalgic as each course rolled out. Final word: There are lounges and bars all over the Star Princess. Seriously, you trip over them everywhere you go. Slow down and spend a moment. They each have their own vibe and it’s fascinating to see how Princess creates a series of little worlds on a single ship. One of my favorites is the Vista Lounge, a swanky 1940s Rat Pack joint with crooner tunes playing all day long. I’ve done a lot of my Avid Cruiser work in that lounge, and often times I was the only person in there. Until a ballroom dance class showed up. So it goes on a big cruise ship. Tomorrow we spend the day in Victoria, BC. We’re booked on a double decker bus tour of the city. It’s a bit touristy for our tastes, but then again, I secretly take these bus tours in nearly every city I visit across the world. My photographic memory loves to survey the situation and then set off to explore neighborhoods that seem interesting. Stay tuned and we’ll tell you what we find! We have also signed up for anytime dining on the Star Princess next month. I’m glad to hear you liked the buffet – other reviews have been mixed. I like the location and it looks like we’ll be able to sit outside in nice weather. About the dining rooms – do they have large windows? Do they have tables for two as an option? The buffet isn’t fancy, to be clear, but the food is comparable to a good diner. The variety is great, you can’t beat the convenience, and there’s always fresh cut fruit. That’s a nice bonus. 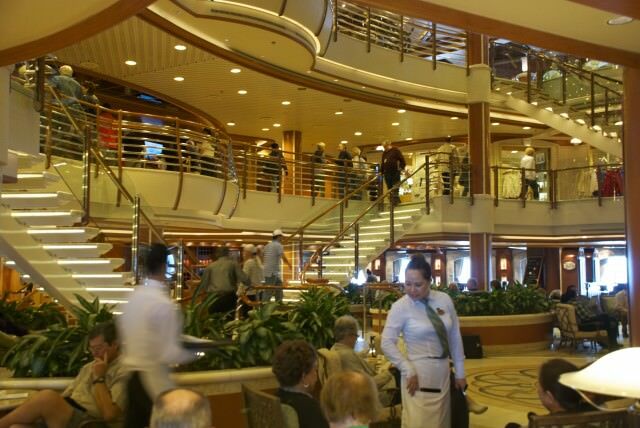 From the buffet you can sit anywhere on the Lido Deck, inside or outside. The dining rooms (and the table area around the indoor pool) all have large floor-to-ceiling windows. You may need to do a few laps and possibly stalk people that are finishing their meal, but it’s possible to snag a window seat. It’s lovely. The dining rooms also have windows. We never requested a specific table, but I heard other people do that. The luck of the draw put us near the window three times, though. With Anytime Dining the default is to fill tables as they fill them and you sit where you sit, but it’s worth asking. They do have tables for two in the dining rooms. You may need to wait longer than if they put you at a communal table as you show up, but yes, you can sit with just one other person. We skipped the formal nights. On our way to the buffet or Trident Grill we saw everything ranging from women in pantsuits to furs, men in khakis and dress shirts to tuxes. We did participate in the smart casual nights, which involved simple cotton dress for Heather and I. They offer professional portraits on the formal nights, sort of like a prom or wedding. Photos are available for purchase throughout the cruise. The Portofino and Capri menus are identical. The Amalfi menu, which is traditional dining only, is something I can’t verify. Crown Grill and Sabatini’s, since they are fine dining with a cover charge, have their own kitchens with unique menus. I hope this information helps. My advice is to make the rounds, try out all the different venues you can, and Sabatini’s is worth the $25. Gail, thanks for taking the time to post so much information — it does help! I know we’ll figure things out on board, but this gives us a head start. Like you, we’ll probably try most of the options (and also probably skip the formal nights). A little known secret on the Star Princess is that you MAY be able to get dinner room service in the evening with selections from the Main Dining Room. It was our understanding initially that dinner room service was only available from a small selection of bar type food items. Upon calling room service and asking if we could get Main Dining Room selections the staff were happy to comply. That was a recurring theme on our cruise — Princess staff often threw out the rulebook if it meant making a passenger happy. Excellent tip. Thank you for letting us know!